One of my favorite holiday traditions is creating homemade food gifts and DIY craft gifts (like personal care & beauty) to give to family & friends. Every year I try something new (to keep things fresh) and this flavored salt might make the list. I actually came up with this infused salt recipe last fall for GLAMOUR (I was featured in the December 2017 print version of their magazine - dream come true) and have been patiently waiting to share it with y'all here on the blog. You've probably seen flavored salts at gourmet food stores in fancy containers with high price tags. No need to fork over all that moolah to impress your foodie friends! Flavored salts are simply coarse or finely ground salts that have been mixed with fresh or dried ingredients (or possibly oils or extracts). Over time (hours, days, or weeks) the ingredients infuse into the salt and imbue it with flavor. You then use the flavored salt to season food before cooking or at the end when the dish is finished. TIP: You can use this same technique for other granular ingredients like sugars. My favorite is vanilla infused sugar (good for baking and homemade hot cocoa) and espresso infused sugar (good in brownies). There are a ton of ways to make flavored salts but many ingredients are seasonal and hard to find in abundance during the fall & winter months. As much as I love my basil sea salt, it's more expensive to grab big bunches of fresh basil this time of year! 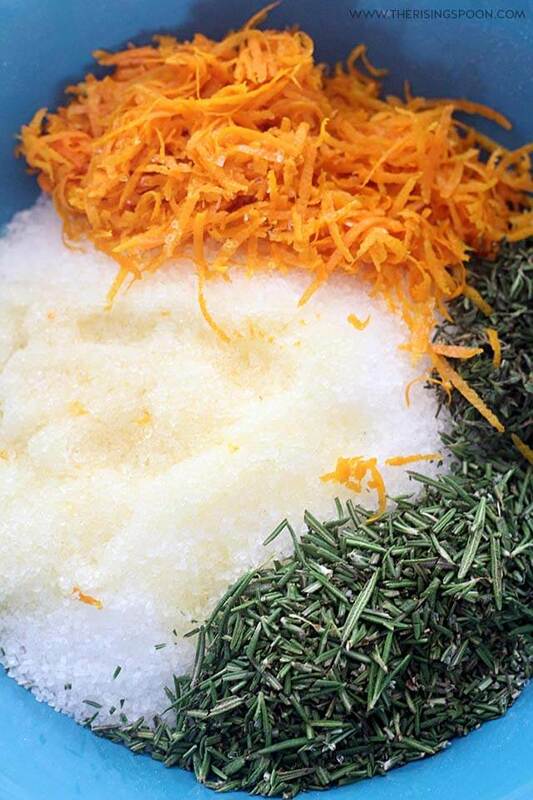 So, I created this flavored salt using herbs and citrus available year-round: rosemary, thyme & navel oranges. These also happen to be some of my favorite flavors for seasoning poultry (like roasted chicken and turkey) and vegetables like potatoes. 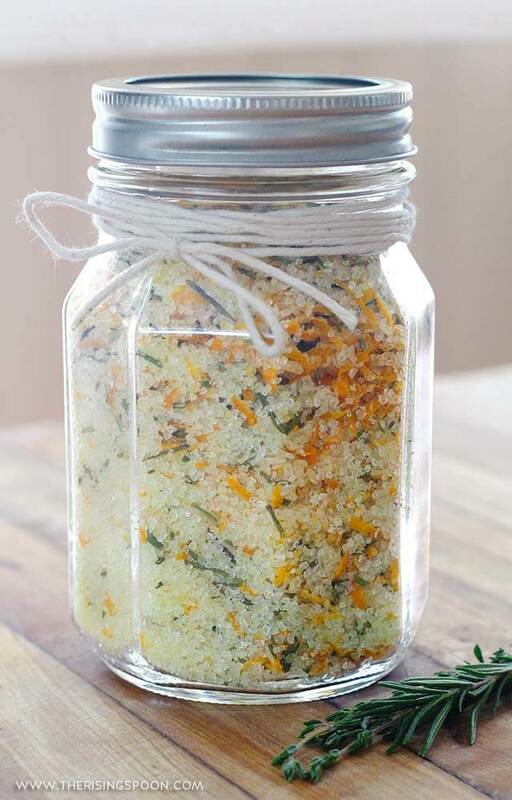 If you're making this herb salt (or other infused salts or sugars) for homemade gifts it's helpful to include a handwritten or typed card with ideas for using the salt in recipes. 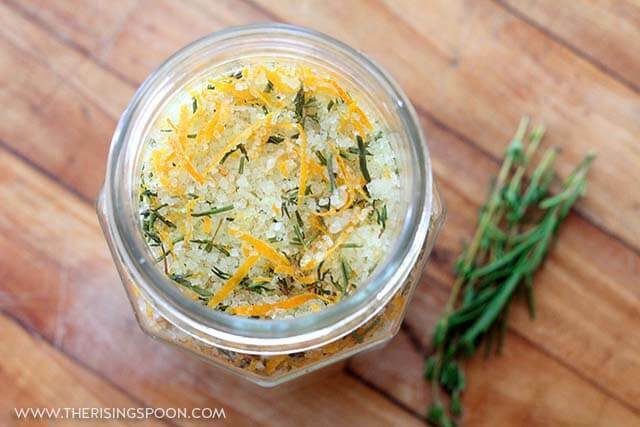 This infused salt isn't just for eating! You can also use it in homemade personal care products. That's the beauty of using natural, non-toxic ingredients. They have many uses. I'm betting you have friends & family that aren't big on cooking BUT love natural personal care stuff. 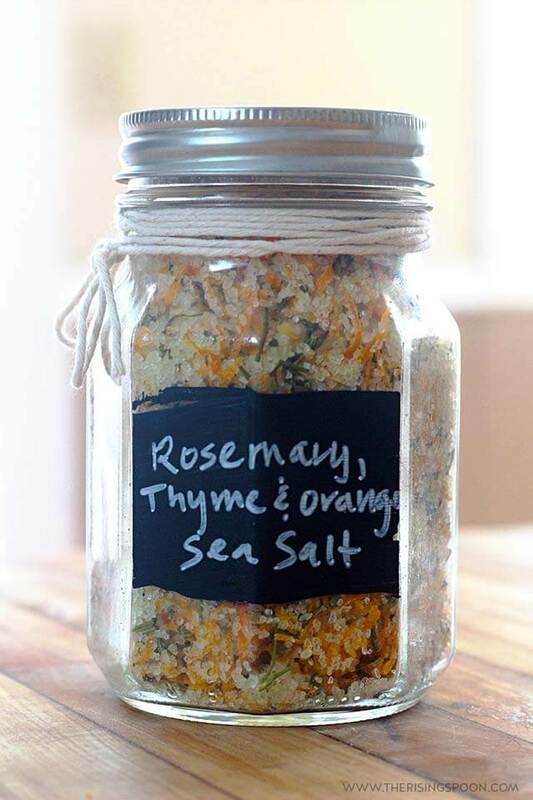 Kill two birds with one stone by making a big batch of this flavored herb salt to give to the foodies in your life and transform part of it into DIY beauty products for everyone else. Mix this dried herb salt with a carrier oil (like olive oil, grapeseed oil, jojoba oil, or softened coconut oil) to make a homemade sea salt scrub for exfoliating skin! 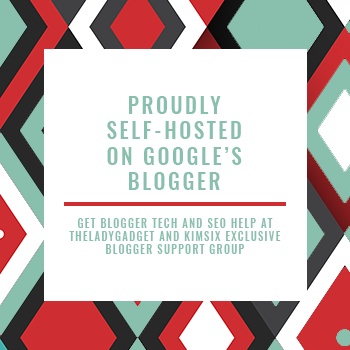 I have pretty sensitive skin so typically use fine cane sugar for homemade scrubs, but sea salt can have even more exfoliating power and you also get the benefit of the trace minerals. For tips on making exfoliating scrubs & the amount of carrier oil to use, check out my lemon sugar scrub and honey lavender lip scrub posts. Dump a 1/2 cup of this infused sea salt into a hot bath along with plain Epsom salts, magnesium chloride flakes, and baking soda for a revitalizing (rosemary is energizing) bath soak! The vitamin C from the orange zest is also good for your skin. 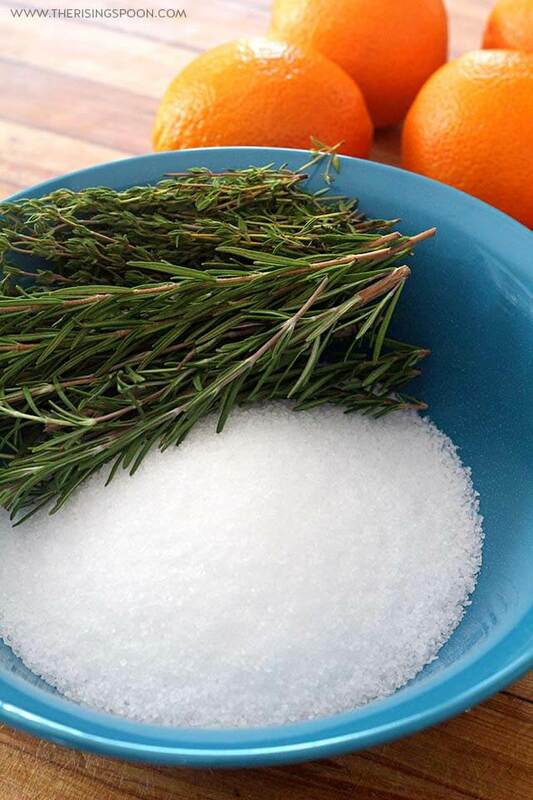 Smelling the rosemary, thyme & orange combo would definitely brighten your mood, too! Note: If you want to pre-make the soak mixes for gifts, portion everything into a big glass bowl (infused salt, baking soda, Epsom salt), make sure it's mixed super well, and then scoop into glass jars with tight-fitting lids. The ratios you use for the soaks are a personal preference, but I always make Epsom salt the main ingredient, with sea salt (in this case it'd be the infused salt), magnesium chloride (optional - it adds a different type of magnesium), and baking soda in smaller portions. You have lots of options for containers, but the most important thing is to keep it air-tight. You want those flavors to stay in the salt! My favorite vessels for homemade gifts are small glass jars with either a screw on lid or hermetically sealed lid (like Weck, Le Parfait or Bormioli). They're eco-friendly, re-usable, and look really nice! Some of my favorites are 4 oz quilted Ball jars, 5 oz Italian canning jars, or mini mason jar shot glasses. If you're shipping this, the glass may not be a good option (too heavy & fragile) so look for sturdy BPA-free plastic instead OR for short-term storage, clear bags, wax bags, or kraft paper bags (tell them to transfer it to something air-tight when they receive it). I typically wrap my glass jars in a bit of hemp cord or red & white cotton twine for a simple accent and label it with a hand-written paper card OR a chalkboard sticker. For these pictures, I actually bought chalkboard paint and chalk paint markers from Target. Both options are cute! Measure the sea salt into a large mixing bowl and set aside. Wash and dry the rosemary and thyme. Remove the leaves and discard the woody stems from both herbs. Grab a cutting board, finely chop the rosemary and thyme with a sharp knife, and measure both into the bowl along with the salt. Wash and dry the oranges and use a zester tool to remove the peel from all six oranges in small, thin strips (make sure to avoid the white pith underneath). Alternately, you can use a small sharp knife to remove the peel in large strips and cut it into smaller pieces afterward. Juice two of the oranges over a small bowl (remove any stray seeds). 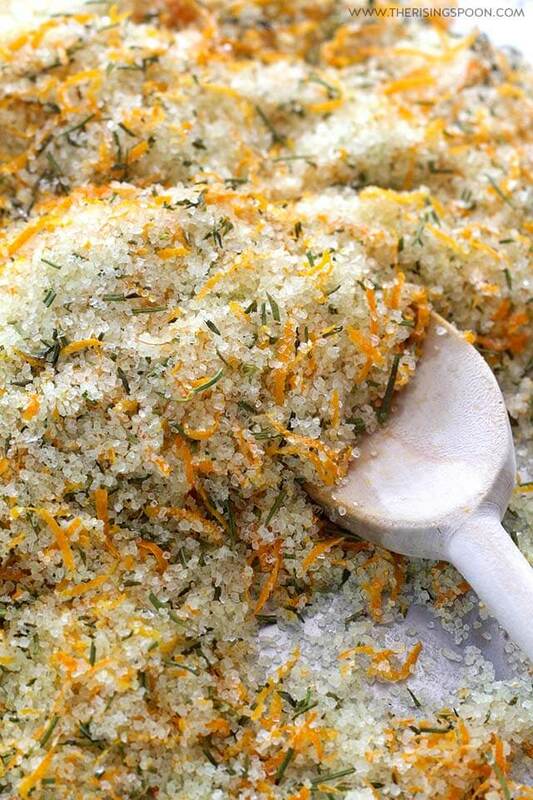 Add the fresh juice and orange zest to the sea salt. Stir the salt well with a wooden spoon so the orange juice, herbs, and zest are fully incorporated. Spread the mixture evenly onto a large rimmed baking sheet. Set the oven to 220 degrees and pop the sheet inside. Bake 30 minutes or until the salt is no longer wet, stirring once halfway through. Break apart any clumps with a wooden spoon or fork and store the finished salt in an airtight container in your pantry. For best flavor, consume within 3 months. Feel free to substitute other citrus fruits like lemon, Meyer lemon, blood orange, or tangerines if you can't find good navel oranges in your area. 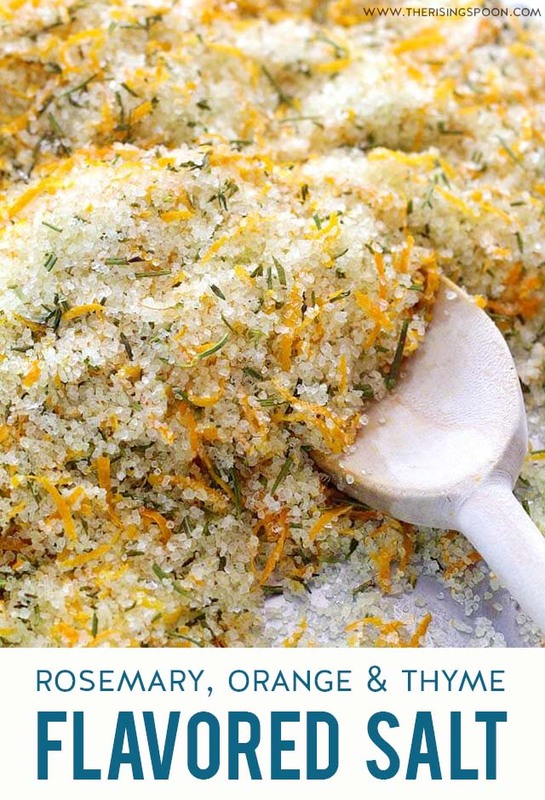 For recipe ideas using this herb-infused salt, see the post above. Note: I originally created this recipe, along with two other food gifts, back in fall 2017 for GLAMOUR magazine. It first appeared in the U.S. edition of the December 2017 print magazine in the Wellbeing section. 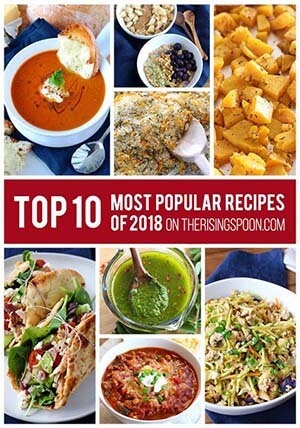 Click Here to Save This to Your Homemade Food Recipes Board on Pinterest!